This year’s Bud Stevenson Intracrew Medley saw a new winning team emerge when the lifeguards from Zuma Beach overtook Manhattan Beach’s “A” team to claim the title. Manhattan Beach has finished in the top three for five consecutive years with championships coming in 2014 and 2015. Venice placed third while 2017 champion Hermosa Beach finished fourth. Following were the Redondo/Torrance/Cabrillo, Santa Monica, Dockweiler, Manhattan “B” and Will Rogers teams. 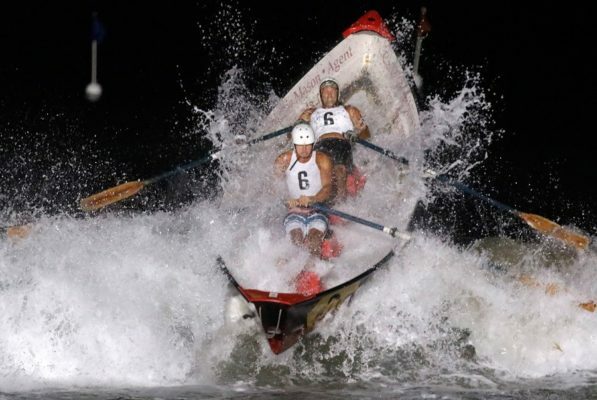 Held under the lights after lifeguards finish their daily workloads, the event consists of two runners, four swimmers, four paddlers, one surf ski paddler, and four two-person dorys. Prior to the start of the Bud Stevenson Intracrew relay, the Los Angeles County Lifeguards competed in the 6-lifeguard run relay, 4-lifeguard shallow water sprint relay, and the 6-lifeguard rescue board relay events. Veteran lifeguard Mel Solberg narrowly missed making the Manhattan “A” team so he rowed for the Dockweiler team. “It was fun because of all the new guys that ended up there,” Solberg said. “There usually is little to no surf but we had a northwest swell this year, which no one was prepared for. It made it interesting. Jenna felt the same way. Murphy, 35, was also on the Taplin Bell winning team. He admits that the victory means more as he gets older. He was the fourth and final paddler named to the “A” team. 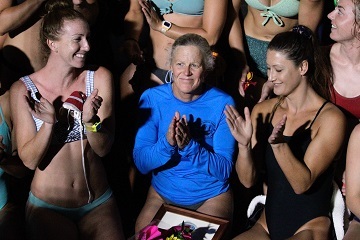 Kelsey Cummings, of El Segundo, continued her busy schedule at the Surf Festival, competing in lifeguard competitions before winning the Pier-to-Pier Swim for the third time in four years. She placed second in the swim in 2016. 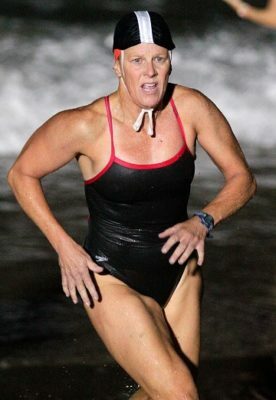 Cummings will join many of the top lifeguards who be competing this weekend in Virginia Beach, Virginia at the United States Lifeguard (USLA) National Championships. 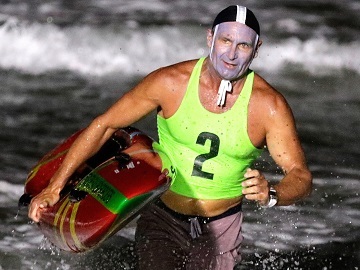 With many lifeguards having to miss last year’s competition, this year’s squad is back to full strength. The LA County team won back-to-back titles in 2015-16 and placed second in 2017 and 2014. Jenna will join her dad in competition at the USLA Nationals and this year, her mother will be attending the event to root her family on. “We have an incredible girls team this year so we should do very well,” Jenna said.